Pack lunch ‘n roll out with some simple Gwaltney Ham and Turkey wrap bites. Cut edges of tortilla to make more of a square shape than a circle. Spread cream cheese along the far edge. It just needs to cover about 1/2″ strip of tortilla. Spread mozzarella evenly over tortilla, starting where the cream cheese ends and leaving about a two-inch strip on the end closest to you uncovered. 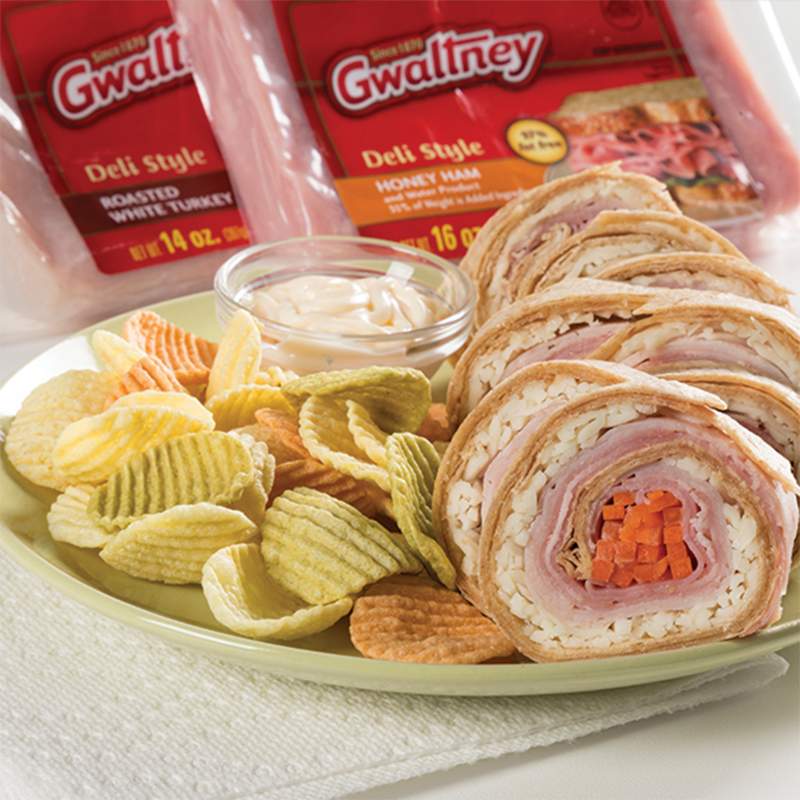 Arrange Gwaltney Turkey slices on that uncovered strip closest to you, and arrange carrots on top of the turkey. Now it’s time to roll! The key is to roll it very tight. Fold over the end with the turkey, and roll it tightly, squeezing it toward you as you fold/roll. Continue rolling and squeezing the tortilla, finishing by pressing the rolled sandwich down so the cream cheese “glues” it closed. Next, use a sharp knife to cut your roll into 1/2″ pieces as shown. Serve with ranch dressing or mayo for dipping if desired.